There’s a story going around the internet that 100,000,000, sorry, 105,000,000 people not working is really great because that would be within 2% of normal from a participation rate perspective, and that the difference is happily explained by retiring baby boomers. In some versions, baby boomers are able to retire thanks to Obamacare. The news is all good – everyone who wants and needs a job has one. More or less. A bit of modeling where roughly 1/3 of the 2/3 of the population who are working are paying most of the taxes supporting everyone else shows that this doesn’t work mathematically. And that’s before considering the $18,000,000,000,000 in debt. But is it even true that folks who need jobs have them and the boomers are blissfully retiring? The following graph (http://data.bls.gov) shows the labor participation rate from 1950 to present. The big changes are from a “historical” rate of around 58% to a “new normal” rate of about 66% as women entered the workforce in significant numbers in the late 60s and 70s. 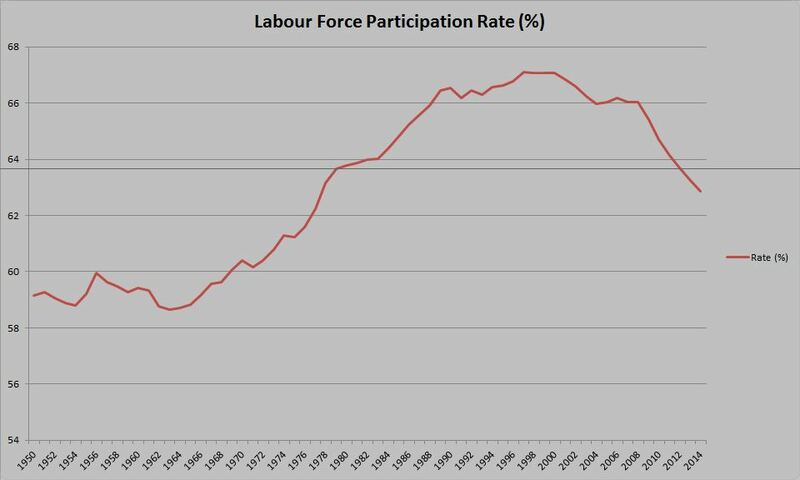 In 2002, the participation rate was 67%. The second big change is that it’s been falling ever since. The increases in rate of participation are in the 55-64, 65-74 and 75 and older group. Every other demographic is dropping. Years of zero rates on savings are pushing retirees back to work and will continue to do so. The economy is not creating nearly enough new entry level jobs. Adding an additional 5,000,000 entry level workers will put more stress jobs and wages here. And for these stellar results we have taken on $8,000,000,000,000 in new debt in 6 years. It’s interesting to consider why thinking sensing people are willing to believe blatant nonsense. Certainly confirmation bias is real and explains some of this. But as Charles Murray has clearly documented, America is increasingly segregated on class lines. The super-rich live with the super-rich. The rich with the rich. Upper middle class, …, and so on. When you combine physical isolation with the effects of the economic policies of Obama-Bush which dramatically favor the wealthy, the conditions are excellent for some silly happy-thoughts. Indeed if you are a liberal in Seattle right now your very eyes tell you that Obama has created a golden age for everyone. Cleveland perhaps not so much.